A weblog for a more civilized age. I live by iCloud reminders. On any given day I’ll probably create at least 5 reminders, both for things I need to do that day as well as further out in the future. Out of all the different task/reminder systems I’ve tried, iCloud reminders seem to be the most effective in getting me to actually complete things. Many tools send you a single notification when something is due and if you brush that off because you can’t do it as soon as that notification arrives then you won’t be reminded again. Reminders on the iOS lock screen are “sticky” and you’ll keep seeing them until you take some action. Being able to create new reminders effortlessly without interrupting my work is important to me. For years, I used an Alfred 3 workflow for creating reminders. It works well but requires me to remember a specific syntax. Even after using it for that long I would often need to look up how to do something that was different from my most common usages. When Siri came to macOS, my first thought was that I would never end up using it. When am I ever going to talk to my Mac? Certainly not at work and not likely at home either. I promptly forgot all about it until not too long ago when it dawned on me that I had seen something about using text to control Siri being added to macOS and that might give me a new way to manage reminders. There’s already a default keyboard shortcut for launching Siri, which is to hold down Command (for a second or so) and then press Space. If you want to change that, it’s under the Siri section in preferences. This is where you can also turn voice feedback off if you want. That’s what I’ve done since I never use voice commands and I can always read the feedback on screen. Remind me to water the plants when I get home. As nice as that is, there’s still one thing that the Alfred workflow does better. Whenever certain applications that it supports are active, it can create a reminder with a link to the URL or file open in that application. For example, if I want to remember something about a page I have open in Chrome I can run the workflow with r this in 30 minutes and it creates a reminder that includes the URL. This kind of context-awareness is something I’d like to see more of in Siri (and apps in general really). After seeing glowing praise from Jessie Frazelle and Brian Cantrell for The Soul of a New Machine I decided that I had to give it a look. (And then I promptly got hooked by Amazon’s “buy this too” recommendations and grabbed Where Wizards Stay Up Late and Hackers for good measure. I guess I’m on something of a history of computing bender) These books were a great way to spend some of the extra time I found myself with during last month’s challenge. TSoaNM is definitely worth reading. It’s the rare kind of technical journalism that not only captures the experience of what it’s like to create systems but also really gets into the details of the challenges and explains them in a way that doesn’t over-simplify them but doesn’t sacrifice clarity either. What I think surprised me the most was just how relatable the engineers and their environment were, despite the 40 year time difference and the fact that I’ve never worked with hardware. So many of engineering tropes that I’m familiar with were recognizable. There’s a part near the end where two engineers finally solve an elusive bug and just as they’re declaring victory, they sse that a different test has started failing. One of the most dreaded feelings an engineer can experience, captured perfectly. Or perhaps the most relatable part was the feeling many of the engineers had of not being able to set down a particular problem once it had hooked them, but having to dive in and obsess over it until it could be understood. Despite all the differences in technology, some things just never change. “Somewhat puzzled and bent on self-improvement” wouldn’t be a half-bad description of how I see myself. Not the smartest, not the dumbest, but just intent on learning and determined to see things through and make them work. It’s interesting too that this this story with all of the drama and long hours doesn’t exactly wrap up with an ending fit for a movie. The Eagle doesn’t end up igniting the world and going on to be a landmark in computing history. The team receives accolades and moves on, drifting apart into other projects or other companies. Despite the limited lasting impact, no one seems to regret the effort that they put in. They shipped something they were happy with, and often that’s enough. Being deeply engaged in the creative process is intensely rewarding on its own, and getting to finish the project and get it out into the world is even better. One of my best work experiences had similar elements. It was demanding and difficult but I was working with great people in a creative environment building something big and new. We were given a great deal of latitude to solve problems ourselves and work independently. Meetings were largely unnecessary as informal conversations and debugging sessions provided a constant source of communication and feedback. Entire weeks went by working completely on a maker’s schedule. And it was great when we finally shipped, but also kind of a let down. Projects like that are hard to move on from. Even when you’re working with many of the same people, the energy just isn’t the same. …it seemed to me that computers have been used in ways which are salutary, in ways that are dangerous, banal, and cruel and it ways that seem harmless if a little silly. But what fun making them can be! I actually have no idea. Given that I did it, this might seem odd but there it is. Well, I suppose I can’t say I have no idea. Tracking calories, eating less, and exercising were certainly helpful. But I’ve tried each of those things to some degree in the past. How is that this time I’ve managed to keep going long enough (8 months so far), unlike prior attempts that burned out quickly? Sadly, that’s where I can’t make any grand pronouncements that will work for everyone (and if I could, I’d probably be rich). What I can do is try to hazard a few guesses about what worked for me. I turned 40 last year. After spending the better part of the last 15 years 20-30 pounds above an “overweight” BMI, I finally had to come to grips with the fact that time wasn’t on my side. I knew that it wasn’t going to get any easier from here on out and I really wanted to see if I could get things under control before my 40th birthday. This is likely one of the factors that helped me see it through. However, there’s another reason that my age may have helped. Over the years I’ve noticed that my perception of the passage of time has quickened. Working on something that takes months would have seemed an eternity in my 20’s but now seems like a manageable amount of time. Instead of giving up with a barely noticeable shift in weight after a few weeks, now I find myself noticing as the months drift by and the losses accumulate. Last August my wife and I decided to try the Whole 30 diet. The gist of this is that you cut out lots of kinds of foods (grains, legumes, sugar, dairy, alcohol, etc) entirely for 30 days to see how you feel and then gradually reintroduce them to see which ones have a negative effect on you. (I suppose this was actually my first 30 day challenge, although I wasn’t aware of the concept then) I went into this with a healthy dose of skepticism; any diet with a ™, ©, or ® seems likely to be driven more by marketing than science. The idea that a few categories of foods could be responsible for such a wide range of maladies rings of the dreaded “toxins” so often decried by pseudo-scientific nonsense. In this case though, the idea of eliminating and reintroducing had just enough of an experimental feel that I figured “why not?” and if nothing else cutting out that many sources of calories would certainly jump start my progress. It certainly did that. I lost 10 pounds in August and we hadn’t even started at the beginning of the month. The experience was generally much less grueling than I thought it would be, although I did come out of it not wanting to eat any more almonds for quite a while as those were one of the few reliable go-to snack options. As for the other supposed health benefits? Well, not so much with one notable exception. Eliminating added sugar produced a noticeable change in how I felt. Specifically, I think that contributed to “smoothing out” the rate at which I would get hungry and made it easier to avoid eating between meals. It’s also lead to a lasting change in the way I eat. I’ve long since reintroduced sugar but I’m eating only a fraction of what I would before. It wasn’t uncommon in the past for me to succumb to a late afternoon craving and make a vending machine run for candy but I’ve been avoiding that entirely. I also haven’t had any kind of soda (artificially sweetened or not) since then and I don’t intend to start again. I’ve never needed much of an excuse to record and chart data about the most trivial things, so getting into gathering all kinds of data about my progress was only natural. I tracked my calorie consumption using the LoseIt app, calories burned via Apple Watch and weight + body fat percentage via a Bluetooth scale and Apple Health. Calorie tracking has gotten convenient enough that I’ve made it a part of my regular routine without much hassle. (I’m currently on a 237 day streak). I don’t measure or weigh everything I eat so I’m sure there’s quite a bit of inaccuracy but I have to hope there’s enough over and under counting that it balances out. I think I’ve gotten a lot better at estimating quantities of measure and even guessing calories for things without looking them up. This is both good and bad, as it can help keep me on track in situations where it’s not convenient to get out my phone but on the other hand now I automatically think about a guess even when I’m just having something I want to enjoy as a treat. I had used various models of Fitbits for years before this, but they never motivated me to change my behavior the way that the Apple Watch did. It’s hard to say exactly why but the reminders and challenges on the Apple Watch just feel more compelling. 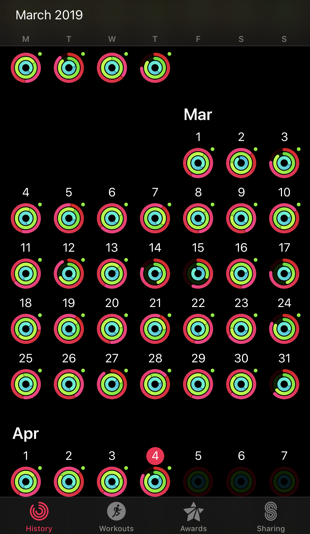 Filling the activity rings is really satisfying for some reason, and focusing on calories expended (Apple’s primary metric) rather than steps taken (Fitbit’s primary metric) feels like a more logical approach. 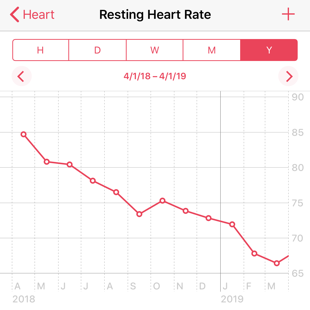 With a reasonably accurate picture of my net calorie loss/surplus and daily weight updates, I’m able to set up a kind of feedback loop and regulate myself. I don’t feel bad if I have a few days where I go over my calorie goal for a special occasion because I can see that those are not the norm and I can see that the trend of my weight is going in the right direction. Physical activity has never been my favorite thing to do. 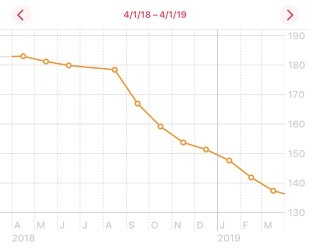 After a few months of weight loss, my rate started to slow and I knew that to keep making progress without dropping my calorie goals to something unrealistic that I would have to start getting more active. I started by taking a walk after lunch every day, and then ellipticals at the gym and then to jogging on a treadmill. For me, the treadmill feels the most effective. With an elliptical it’s easy to slow the pace without noticing, especially if I’m watching something while I do it. On a treadmill, the pace won’t slow unless I make an effort to adjust it and that keeps me going. I run a 5-4-3-2-1 fartlek (yes really. stop laughing.) program now and I’ve seen a huge improvement from when I started and could barely run for 2 minutes at a time. Another nice data point from my watch has been tracking the change that this has made in lowering my resting heart rate. That’s the kind of progress that would otherwise be really hard to see and it has kept me encouraged at times when it feels like my fitness hasn’t been increasing noticeably. Another app that I’ve found helpful for getting into a good exercise routine is Streaks Workout. It creates a random “playlist” of short exercises that you can do anywhere without out equipment. 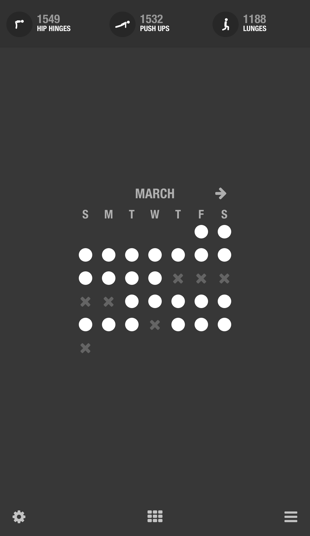 The first thing you see in the app is a calendar view that shows how long your streak has been going on, which can help give me that extra motivation to keep going on the days that I don’t feel like it. To wrap up, I know all of these things helped me make it to my goal. I just can’t quite explain how they worked this time when I abandoned similar approaches in the past. In the end, perhaps it was a series of seemingly minor differences that added up. By starting with a 30 day window around a diet change, it was easier to get through the hard part because I knew it was temporary. When I got to the end, my mindset had been shifted enough that it was easier to keep from reverting completely to my prior habits. With improved food databases, faster phones and better UI calorie tracking was just enough less inconvenient to be able to become part of my routine. And finally with the Apple Watch’s better user experience around reminders and more types of metrics for tracking progress, I was motivated enough to power through the early morning wake-ups in the dead of winter to go exercise. Or maybe I’d just reached a point in my life where I was ready for it. No matter what the actual cause was I’m glad that I was able to get to this point. Half the fun of having a blog is nerding out over how the blog is built. When I started 18 years ago (that can’t be right) I used MoveableType, which generated static pages for publishing. It worked well enough, but I wanted a Real Website™ with a database and everything so I switched to WordPress some years later. Having better options for comments and more dynamic content was nice enough but really for a personal blog it was unnecessary. Keeping WordPress up to date and blocking spam comments just wasn’t worth the effort. After looking around at some of the static site generators that are frequently used in the JAM Stack, I settled on Hugo. This WordPress plugin for exporting to a Hugo site got the job done for me, with just a minimum amount of additional processing needed. My first thought was just to start publishing using GitHub pages because it’s a free and well known choice for developers, but then I heard about Netlify from Julia Evans and thought it would be worth a try. The experience with Netlify has been great so far. Really though, the main reason that I wanted to write about this is that I think they are a great example of how there can be a surprising amount of opportunity and untapped potential for improving in product areas that seem to have a number of obvious “good enough” solutions. Static site hosting is certainly something that I would have previously considered to a solved problem. As a developer, it’s already pretty low friction to throw a generated site up on S3 or use the aforementioned GitHub pages. What else can you really do with static sites? A lot, it turns out. A Deploy to Netlify button can create a GitHub repo and deploy a template of a new site that will be live in seconds. Even when there are plenty of other options, something super simple that just works is compelling. Let’s Encrypt certificates that are automatically provisioned so every site can use SSL without any effort. Preview urls generated from branches in your repo to actually see how it will look, not just how it looks when you build locally. Support for running a build command so that you can use the static site generator of your choice. GitHub Pages are great but if you don’t want to use Jekyll then you have to manage generating your site and committing the output to the repo before pushing. It’s good to be reminded that even with technologies that might seem to have no room for new ideas, focusing on providing a high-quality user experience can still yield substantial improvements. For my April challenge I’m going to be doing 30 minutes of writing every day. I’ve got quite a few topics that I want to write about here and I’m hoping to start a dev blog as well to write about software. The goal definitely isn’t to publish something every day. I’m not sure how many things I’ll actually end up publishing but I’ll at least make progress every day. Right now I feel like it takes me much longer than I would like to be able to organize my thoughts and put something together. One of the things that I’m hoping I’ll get out of forcing myself to practice is that this will get easier and eventually require much less effort to be able to end up with something that I’m satisfied with. Of course, adjusting the expectations for what I consider to be “good enough” may also be part of that process too. I’ve finished the first of my 30 day challenges, so here’s the summary of how it went. For this challenge I decided to avoid using my phone while I was at home. I wanted to do this because I found myself using my phone to fill time at home that I really would have been better off doing something else with. Using my phone was a way to avoid doing not just things that I needed to do but also things that I wanted to do but that were more effort than just swiping through things on my phone. It also gave me an excuse to be less present and aware of time with my family. So how’d it go? Whenever I would come home, one of the first things I would do would be to go plug my phone in and leave it on the nightstand. I found this made it easier to keep from thinking about it or from accidentally slipping into habits. For a while if I left my phone in my pocket I would find myself reflexively pulling it out as I went through my routine only to catch myself and put it back right away. After a couple weeks of leaving it on the nightstand I was able to start carrying it around again without having this problem. I think that I did a good job sticking to the spirit of the challenge and the goals that I had for it, but I did learn just how hard it is to completely disengage from that device. I hadn’t really considered that since I use Google Authenticator for 2 factor auth there were going to be cases where I really had to use my phone to log in to something. I also didn’t want to give up tracking my weight with a bluetooth scale that relied on an app on my phone. So there were still some limited cases where I allowed myself some brief usage. However, I completely avoided using Twitter, checking mail, reading news, etc on my phone. One of the things that I immediately noticed was how quickly I started doing things that I’d been thinking about using other challenges to motivate myself to do. I read more (physical books no less! ), worked on personal projects, and got more done around the house. Those just felt like the natural things to do when I didn’t have the easy default option for passing the time that I’d come to rely on. Sure, I also watched more shows and spent more time on my computer but for the most part I think the time that I got back was well used. I hadn’t thought about this part of it at all, but I was able to get more sleep this month than I normally would have. Previously when I would look at my phone in bed I would often intend to do for just a few minutes but that could easily turn into 20 or 30. So despite having fairly consistent times to get to bed, the actual amount of sleep I had been getting varied greatly. Without that extra time and distraction I found that I slept longer and better. I hate to admit it, but I had been doing a pretty bad job about using the phone during times that I should have been present and paying attention to my family. During our bedtime routine with the kids I would often let myself get absorbed in the phone as I waited for them to brush their teeth or get pajamas on. Without the phone these times I was able to use these times to connect and I could tell that it made a difference. This is definitely one of the areas where I think this was the most beneficial. This challenge was much easier than I’d anticipated it would be, and the results were quite positive. True, there were definitely some inconveniences. 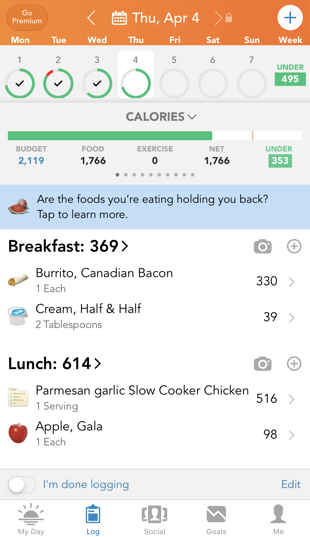 My calorie tracking got less accurate and I often had to set reminders for myself to do something when I could get to my computer instead of doing it right away on the phone. So will I keep doing this now that the challenge is over? I think that I’m going to make a permanent change to avoid doing anything that takes more than a minute or so when there are people around that I need to focus on instead. During the rare times that I find myself at home alone, I think I’ll probably go back to doing reading or other tasks on my phone. To sum up, I’m pleasantly surprised with the effectiveness of this first challenge and I’m looking forward to more. Fashionably late as ever, I’m just now getting around to something that I picked up on around the new year amid the annual torrent of resolutions for self improvement. Normally I give most of these things a hard pass but the 30 day challenge seemed like an idea that would be a good fit for me. This isn’t anything new, the talk is from 2011 but I just happened to come across it a few weeks ago. Draw something every day. I’m no artist, but being able to visually represent an abstract or complex idea is a valuable communication skill for software developers and I’d like to get better at that. When I started blogging, it was a novelty to share personal information with the world. I loved to share things that I found online, music that I was listening to, little details about my life. After I moved from Ohio to Missouri, it helped me keep in touch with friends that had started blogs of their own. When social media started to eclipse personal blogs, I wasn’t concerned. Quite the opposite. It seemed like this novelty was now going to be something that nearly everyone participated in, instead of just a small tech-savvy set. I wrote here less and less and the site became more of just an aggregator for links to things I found until even that stopped (probably around the time del.icio.us was killed by Yahoo). Unfortunately, things didn’t turn out quite the way I had expected. At first I thought it would be great to connect with every one-time acquaintance, co-worker, and classmate. As it turns out though, there are probably valid reasons why those relationships never went anywhere and being exposed to a firehose of information about them isn’t going to change that. Once everything and everyone was on social media and the novelty wore off it became clear to me that this was nothing like what I enjoyed about having a blog. Having a feed of every picture, every experience, every thought from everyone is overwhelming. Not to mention that a small but not insignificant percentage of those people have some problematic (deplorable, even) views on things that I have no interest in engaging with. Meanwhile, the companies behind these sites have been shown over and over to be willing to do whatever they can get away with regarding the personal information we give them (or sometimes even that we don’t). I’ve always been aware of the adage “If you’re not the customer you’re the product” for free services but I’ve been pretty accepting of my part in that bargain. Even so, there’s only so much I can accept and Facebook in particular has gone well behind that. Twitter is really the only place that I have an interest in maintaining a presence. Despite being a fresh horrors device most of the time, I still find it to be an indispensable source of news about software/infrastructure and weird humor. As a low-friction way to share links and random thoughts it works well enough, despite the numerous problems with the way that it handles abuse. I appreciate the idea of being able to share things in a place I own, with no ads, no feed algorithms, and no likes/favorites/reactions/ratings/whatever. A place that I know I won’t ever have to abandon in disgust after learning about yet another invasive breach of privacy. While it certainly will reach a much smaller potential audience, I’m ok with that. I think a lot of the value I get out of writing is in the way that it helps me to clarify my thoughts on something, rather than the reactions that I get from publishing it. 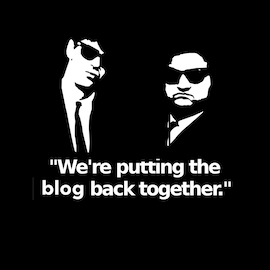 And so, improbable as it seems in 2019, I find myself considering blogging again. I started writing this post as a way to put the site into indefinite hiatus as I migrated it from Wordpress to a static site generator. However, as I got into it I realized that it might be fun to see if I could give this a go again. (Besides it’s been so long that it’s got to be retro-cool to host your own blog, right?) My ideas about what I want to publish are pretty different these days. I don’t really have much of a desire to publish diary-esque dispatches. I’d like to write more essays, especially about software development/operations. That’s fairly incongruous with the archives here so maybe that will end up being a separate project but we’ll see.